Sunday's are generally art free days. Of course, the museums are open and the hoi polloi pour in. But the local galleries and the local artists generally give themselves the day off after a Thursday to Saturday series of openings and parties. On July 21st, however, several artists associated with ArtBridge Houston, gathered at Brasil on Dunlavy to make some paper sculptures and raise money for the Southside Community Center. Southside provides educational and cultural enrichment programs to kids. Recently, it's been the victim of multiple burglaries in which thieves stole everything of value: 14 computers, 4 digital cameras, 4 TVs and supplies. Artists Cody Ledvina and Diana Sanchez work as art facilitators (I think that means teacher) and Nick Meriwether is the co-executive director for ArtBridge, which works with Southside. 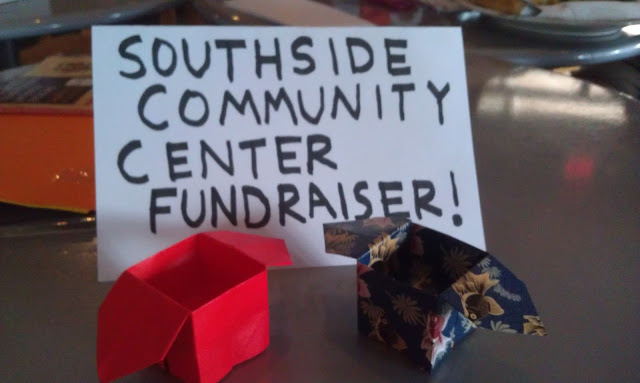 They figured, how hard would it be to teach adults, most of them artists or at least arts aficionados, to create some orgami sculptures for a donation to help Southside get back on it's technological feet? They got schooled. The point obviously wasn't the art, but they earnest in their endeavors. After a half-hour and the onset of a migraine headache, I managed an origami box, and Diana Sanchez started a tab at the bar. Other donors proved just as challenging for the facilitators, so we spent most of our time learning about some of the cool things they do at Southside and gossiping about art and artists. It was a nice way to spend a Sunday evening and a good use of expendable income. If you missed it, it's never too late to donate directly to ArtBridge Houston or contact ArtBridge to see how you can helpout Southside Community Center.